By this point you may have decided to design the garden yourself – or to get some help. We discussed several good options last month. You may also have chosen a theme for your garden. If not, we suggest re-reading that section of last month’s posting (June, 2014). We find that having a theme is a great way for beginning garden designers to limit their choices and produce a unified design. Last month we cautiously approached the topic of garden design, discussing color, garden themes, the concept of ‘garden rooms’ and the power of simple designs. This month we consider additional design elements and begin to define the characteristics of plants we’ll use for different parts of the design. 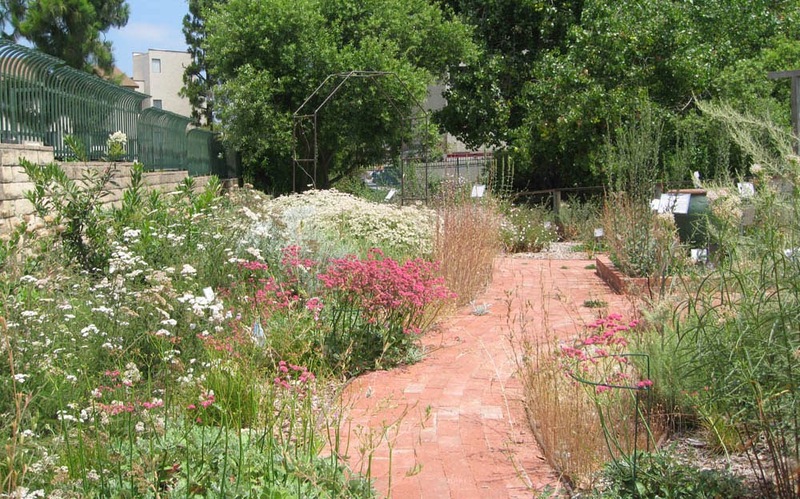 If you didn’t read last month’s post, take the time to read it now: http://mother-natures-backyard.blogspot.com/2014/06/designing-your-new-california-garden-11.html. Garden design is a creative process. It requires focus, knowledge of plants, time and plain old tinkering. The creative process is the same, whether you’re creating a painting, solving a scientific problem or designing a garden. You begin with an idea, problem or question (basic focus) that gives some order to your work. You next define the guidelines or parameters that give structure to the basic problem. This stage is often a circular process: trying out possible guidelines, learning more, revising the guidelines and so on. You’ve actually been involved in this stage all along, as you’ve worked through the activities. The site physical characteristics and your wishes help define the parameters for your design. The third stage is gestation. This stage is akin to biologic gestation; there’s a lot going on beneath the surface, but the final product is not yet fully formed. You may feel like you aren’t getting anywhere, while your mind is filled with too many conflicting ideas. This can be a frustrating time for some people; but it’s an absolutely necessary and normal stage in the creative process. Once this stage is over (and you’ll know when it is) you’ll emerge with a ‘eureka moment’ – when everything seems to come together as if by magic. Of course it’s not magic at all; you’ve spent plenty of time and effort preparing for this stage. 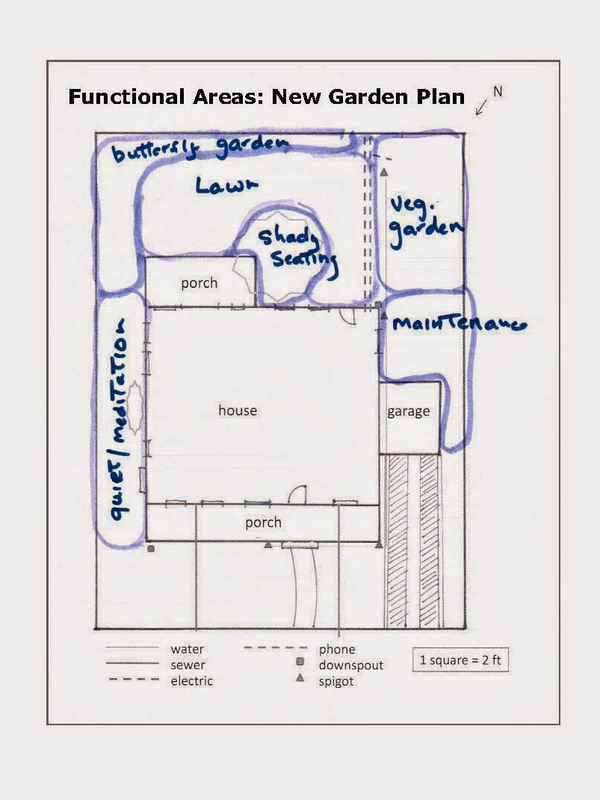 But the last stage is when you can literally put the entire Garden Plan together. The design process may seem like a lot of effort – and it is. For some, the time and effort will seem like play; for others it’s more like torture. If you’re one of the latter, consider hiring a professional landscape designer to complete the Garden Plan (see our June 2014 posting). Designers go through the creative process all the time – it’s what they do. They can take your preparatory work and create a plan that reflects your needs, desires and history. 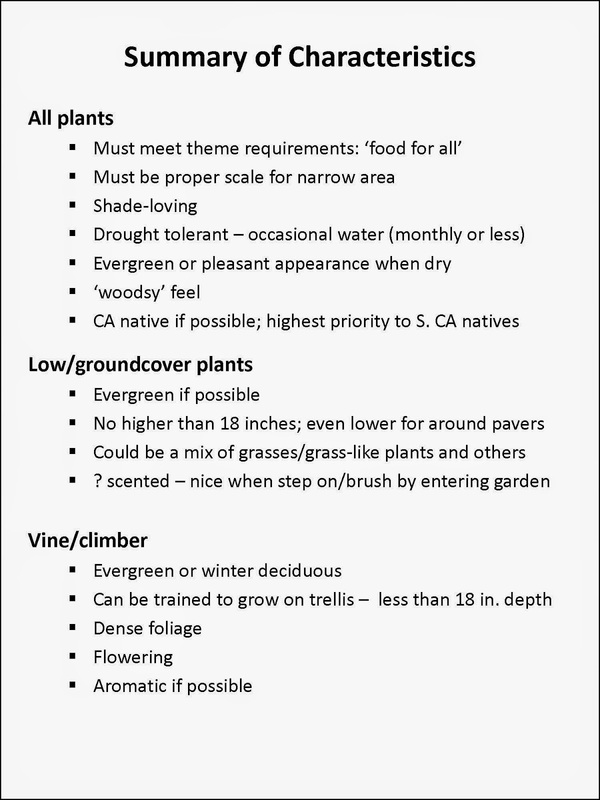 Just be sure to choose a designer who specializes in California (or other local) native plants and who is sensitive to your desires. If you want to design the garden yourself, we’ve a few more ideas to help you along the way. Using these time-tested artistic tools is an excellent way to design a garden that is attractive as well as functional. 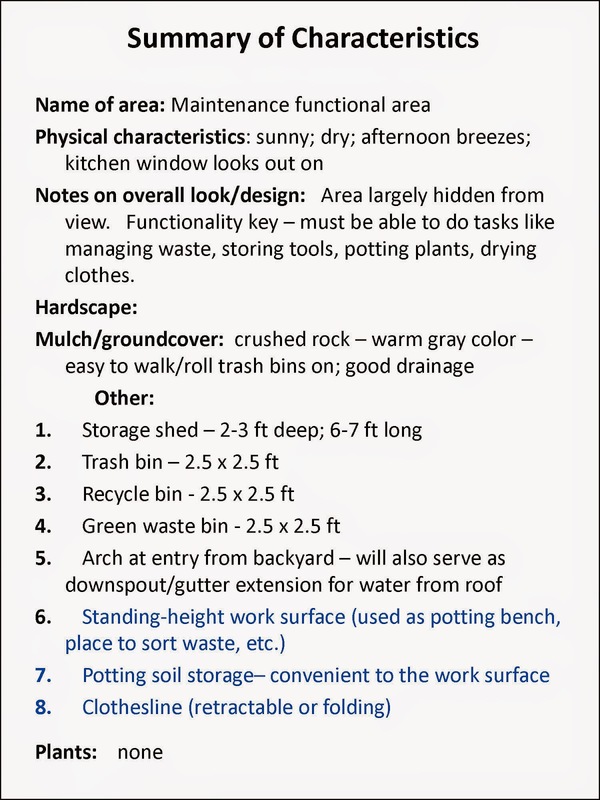 You’ll want to review the design principles several times as you create – and revise – your garden design. The artistic principles underlying a good design are the same for a painting or a garden. Discovered over time, often by trial and error, these principles are passed down from teacher to student. They are the ‘tricks of the trade’ that make a design work. Enclosure – refers to the sense of being in a defined (enclosed) area. Much as a picture frame defines the ‘space’ of a painting, walls, fences, screens, hedges and other features can be used to define the ‘space’ of a garden. Many people, particularly in crowded urban/suburban neighborhoods, feel more at ease if their garden gives a sense of enclosure (privacy). You can also use enclosure to set off separate garden ‘rooms’ – much like rooms in a house. Even a small garden can benefit from division into several rooms. Garden rooms create a sense of mystery; the viewer wants to see what’s around the corner or behind the hedge. Surprisingly, they make a garden appear larger than it actually is. To be effective, garden rooms must demonstrate the Principle of Enclosure. Proportion and Scale – refers to the idea that parts of a design should relate well together in terms of their sizes, amounts or numbers. This Principle is hard to describe; but we all can think of examples of gardens that are ‘out of proportion’. Take for example, a small front yard with a huge pine tree. The pine is out of scale for the small yard. The designers didn’t consider the final size of the tree; the design suffers from the lack of foresight. Similarly, a very small sculpture, meant to be a focal point, is lost in a large open garden. The same sculpture would be perfect in a smaller garden ‘room’, where it would serve as a key element of the design. The principle of proportion and scale applies to all elements of a garden design, from layout to hardscape and plants. You may have seen an over- large gazebo or planter in a small yard – it looks odd because it’s out of scale. Similarly, oversized rustic log garden furniture is ‘too massive’ for a small seating area. More appropriate would be smaller scale furniture such as bistro chairs, retro metal lawn chairs, etc. Proportion and scale also refer to the numbers of parts. Once again, you can likely conjure up gardens in which ‘too many’ pots or lawn ornaments detracted from a design that was otherwise pleasant. At the other extreme, a single narrow tree in very large garden might appear as an orphan; additional trees would make the scale ‘look right’. Emphasis - refers to using parts of a design to catch the viewer’s attention. Emphasis directs the viewer to an object or portion of a composition. Emphasis makes a garden more interesting by providing focal points or accents – places where the viewer’s eye naturally gravitates. Emphasis must be used sparingly. Creating too many focal points defeats their purpose, much as a red dress disappears in a roomful of red dresses. But a design lacking focal points can be confusing – even disconcerting - because the eye doesn’t know where to look first. Gardens without focal points often seem unplanned, jumbled, even chaotic – not what is usually desired. Emphasis can be created in several ways. All involve making one area stand out by contrasting it with other areas. The area could be different in size, color, texture, shape, etc. Vertical elements in open areas of the garden can create interesting – even dramatic - focal points. Garden art or ‘accent plants’ with unusual features are often used as focal points; they are unexpected/different and therefore attract the eye. The placement of accents requires some thought. We suggest spending time in your future garden, observing the vistas. Where does your eye travel when you sit on the patio? Walk out your back door? Do you want to direct the eye to a nice vista? Make the garden appear longer by emphasizing the longest vista? Emphasis directs the eye – use it to best advantage. Repetition (Rhythm) – refers to the use of multiples of the same or similar elements. In a garden, repetition is achieved by massing or grouping individual plants or repeating hardscape elements. Using the same pavers/path materials throughout the garden is a good example of repetition; so is using multiples of the same shrub to create a hedge or background planting. Repetition can also be achieved by using plants of similar size, foliage color or other characteristic. All involve repeating some element. Repetition can be used to do several things. Repetition creates unity within a design. Repeated elements remind the viewer that the garden should be viewed as a whole. We use the same principle when we paint all of a house’s trim the same color; or use the same style of windows throughout the house. Repetition signifies a unified whole. Repetition can also be used to reflect or amplify architectural geometry. For example, the horizontal lines of a house can be echoed by horizontal lines of hedges or groundcover. Or the columns of a porch can be repeated in a fence, arbor or other garden hardscape. This repetition underscores the house’s design and can emphasize the connection between indoor and outdoor space. Repetition of flowering plants – massed plantings – can be used effectively as a means of emphasis. There’s something magical about a mass of blooms – repetitions of the same – that draws the eye like a magnet. It’s one reason why spring wildflowers are so appealing in nature. Repetition is magical! Variety - is created by introducing different forms or types of elements to a design. Variety is the opposite of repetition. Too little variety (too much repetition) leads to monotony. A garden composed of shrubs, all of the same size and color, would certainly be boring. As they say, ‘variety is the spice of life’. On the other hand, introducing too many elements can create a chaotic, unmanageable design; that’s why creating a successful cottage garden (which features lots of variety) is such a difficult design challenge. A fine balance between the extremes produces a pleasant sense of unity in a landscape design. Contrast – refers to the diversity of adjacent elements in terms of color, texture, or tone. Contrast is very important for the overall appearance of the garden; it is one of the chief means to add year-round variety. A garden composed solely of medium-green shrubs is boring due to a lack of contrast between adjacent shrubs. The good designer integrates plants with distinctly different foliage color, texture, or form in such a way as to highlight and draw attention to individual plants. Plants are placed so that the contrasts emphasize the unique characteristics of each plant. For example, a plant with light foliage or bright flowers is placed in front of a plant with darker foliage. The contrast serves to emphasize the characteristics of both plants. Native plants from mediterranean climates (like California) provide a vast array of foliage characteristics from which to choose. Leaf size ranges from miniscule to large and foliage colors from deep green to gray-green, blue-green – even white. Mediterranean and California plants are particularly valued in landscape designs for their contrast value. Be sure to use them if you live in an appropriate climate. Line – In garden design, lines can be expressed in many ways: through paths, walls, fences, edges of beds/planters and the placement of plants. Landscape lines should be pleasing, proportionate and appropriate for the formality of the design. We suggest that you lay out the lines of paths and beds, using rope or a garden hose, before deciding on their final placement. Sometimes seeing a line in place can show you instantly if you’ve got it right. Don’t hesitate to play around until you’re satisfied. Landscape lines direct the movement or sight to a particular area of interest. They can be used to direct the eye to a focal point – for example a line of shrubs leading to a garden sculpture or accent plant. Lines can also be used to set the tone of a garden; formal, geometric lines make a design appear formal, while curved or winding lines are more informal. Scent – refers to the use of aromatic qualities of plants. While unique to garden design, the use of scent in a garden adds another dimension. Well chosen garden scents add a layer of interest that cannot be achieved by other means. Many gardeners consider floral scents when choosing plants. But plants from mediterranean climates can also provide aromatic foliage. In fact, many mediterranean plants (sages; mints; rosemary; etc.) are used as cooking spices, in potpourri and other scented crafts. As with all elements of design, scent must be chosen carefully. Scent preference is very personal – people literally experience a given scent differently. Visit a nursery and discretely smell the flowers or foliage. Scented foliage is best evaluated on a warm summer day, when plants are producing their volatile chemicals. You will find that different Sages (even cultivars) have very different aromas. Choose scents that make you feel good and will add to your enjoyment of the garden. 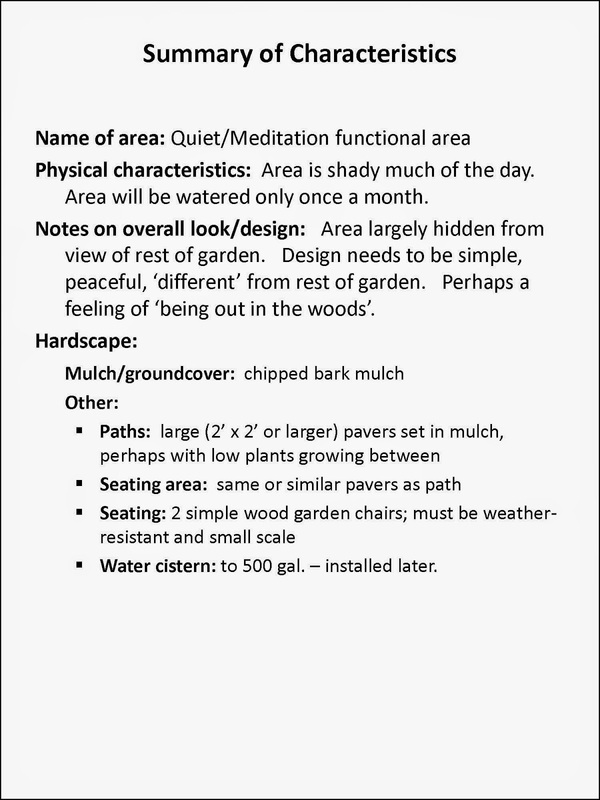 Creating a plan for the entire garden may seem overwhelming. We suggest taking it a step at a time. Different parts of the design must work together in the end. But there’s no reason why you can’t break the task into manageable pieces. Consider designing the functional areas individually. This allows you to focus on a unified set of functions and physical characteristics. Begin with a functional area containing few/no plants. This will ease you into the design process and increase your confidence. In fact, you’ll be surprised how quickly such areas come together, as you’ve already done much of the work. The first step is to create a Summary of Characteristics for the functional area. 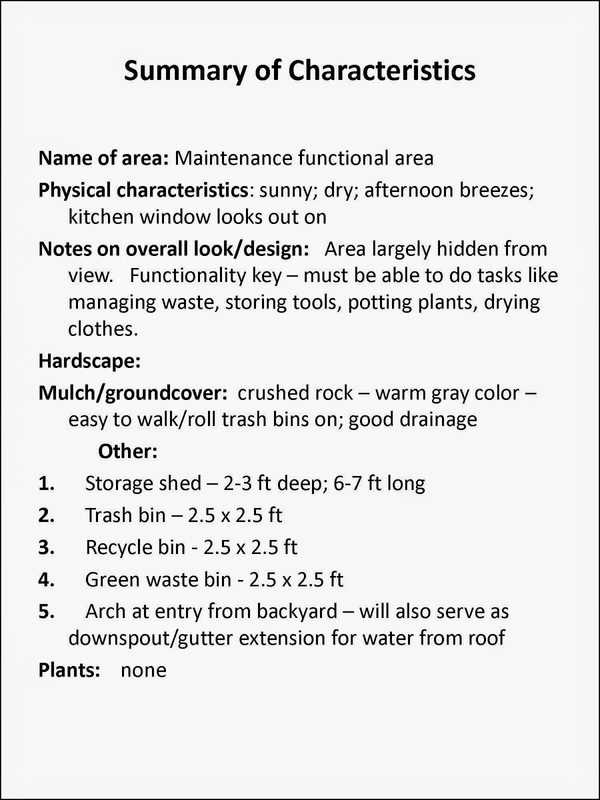 This summary lists the important characteristics of the physical site and design. It summarizes the hardscape elements. It also lists the characteristics of the plant materials to be used (if any). Let’s take an example from the garden at 112 Willow Street. The ‘Maintenance’ area is already largely planned, thanks to the work we did when designing the hardscape. But looking at the design with fresh eyes can be helpful. The gardeners haven’t included some important features that will increase the functionality to the Maintenance Area. These are added to the summary list (below). The Maintenance Area is roughly 12 ft. by 14 ft. The gardeners can fit the additional hardscape into the area - if they plan well. They free up some space by moving the compost bin to the garden area. 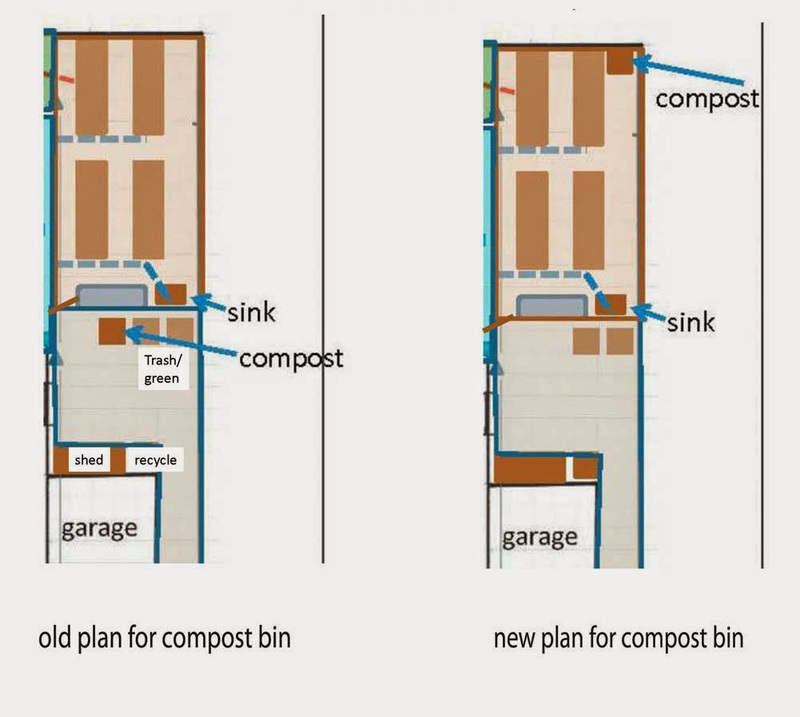 Since compost will mostly be used in the Vegetable Garden – and much of the green waste will come from there – moving the compost bin makes sense. The Vegetable Garden can accommodate a 2 ½ ft. wide, tall compost bin – adequate for the gardener’s needs. Adding a work surface requires some creativity. Fortunately, the recycling bin is short enough to fit under a work surface. A potting soil bin can also be located under the work surface, making good use of limited space. There still is plenty of room in the Maintenance Area for a clothesline. A retractable or a folding clothesline will provide plenty of drying space; either will allow the gardeners to retract the apparatus when not in use. The Maintenance Area, as currently designed, has much to recommend it. It concentrates maintenance functions in single area and is conveniently located. The gardeners can easily envision its daily use. But what of the Elements of Design? A purely functional area, largely out of sight, has less strict aesthetic requirements than other functional areas. Like the interior of a garage or tool shed, functionality trumps design (although a Maintenance area can be quite attractive, if desired). 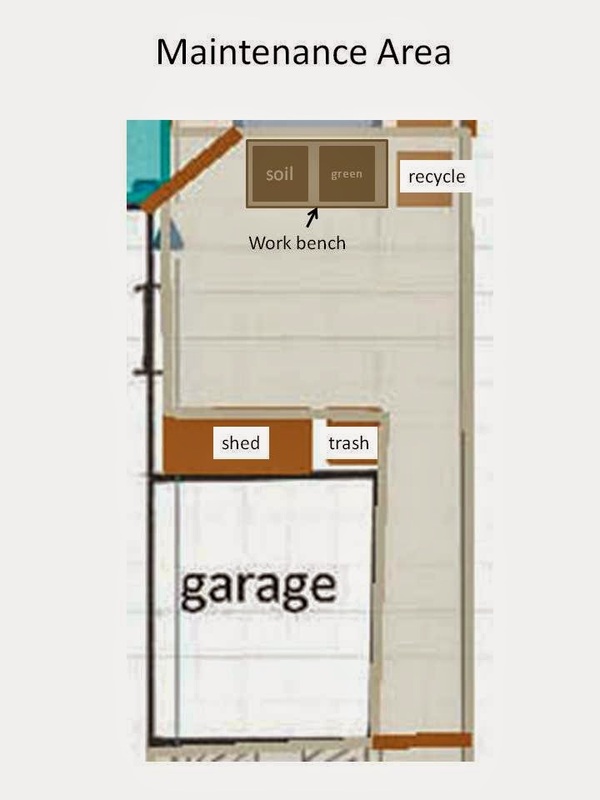 But several Design Elements do play a role in the Maintenance Area at 122 Willow St.
First, note that the area is Enclosed creating a separate maintenance ‘room’ apart from the rest of the garden. The Vegetable Garden is another obvious candidate as a separate room. A low fence, hedge or herb border between the ‘Natural Lawn’ and Vegetable Garden adds to the sense of Enclosure. When designing the arch between the Maintenance Area and the garden, our gardeners will need to consider Proportion and Scale. The arch must be sturdy enough to convey water from downspout to water storage containers in the Vegetable Garden. But it must also be of appropriate scale to blend with the rest of the small backyard garden. The Lines created by the arch should be simple and clean, in keeping with the gardener’s wish for a garden with a slightly formal look. At this point you can likely see the advantage of beginning with an area composed entirely of hardscape. It’s easy to summarize the characteristics of the area. And the area is composed of hardscape elements, most of which you’ve already considered. The design process is a bit more complex in areas that include plants. The gardeners have a good start on their design. In fact, they already have mapped out some of the elements of this functional area (below). The gardeners lay out the path and seating areas with rope to see how they will look. They like the slight meander to the path – it will add to the ‘woodsy’ character of the area. They bring out some chairs and examine the vistas afforded to someone sitting in the Quiet/Meditation Area. One change is immediately apparent – the seating area should be placed closer to the house. That will allow the gardeners two potential focal points – one towards the backyard and a second facing the front yard. The side of the neighbor’s garage truly is an eyesore. The gardener’s confirm their need for a trellis to block the view. After considering their options, they have chosen to add a 4 ft. lattice addition to the top of the existing fence. 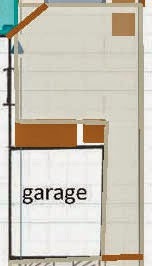 As they sit, they realize that a more attractive option would be to extend the lattice addition beyond the garage. 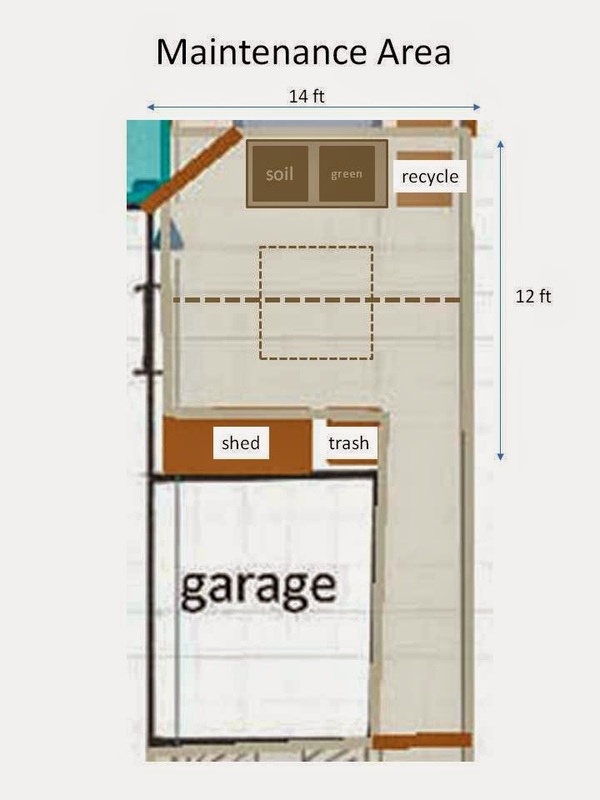 The 4 ft. addition will be fine for blocking the view of the garage. They will taper the lattice down in increments on either side – 3 ft, 2 ft and one ft. The new lattice addition will add an interesting design element to an otherwise bland fence (use of Line). 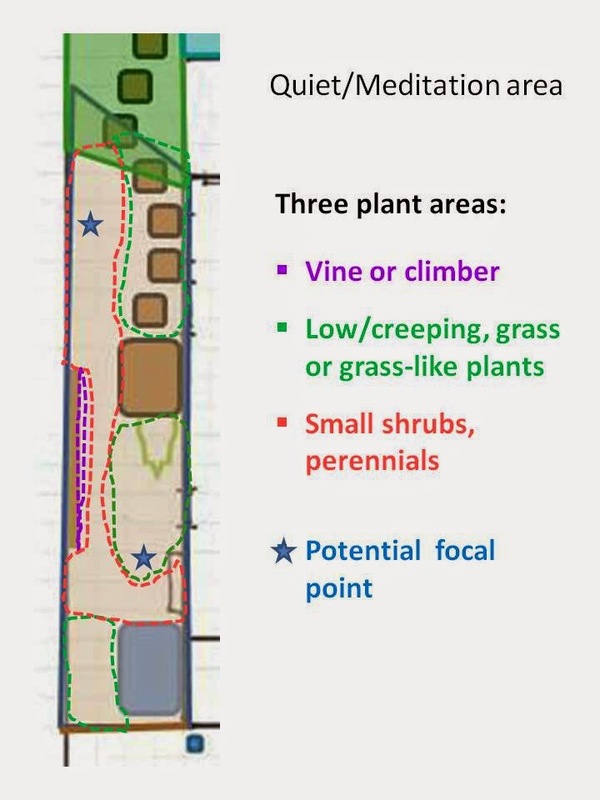 It will also allow a vine/climber plenty of room to grow. 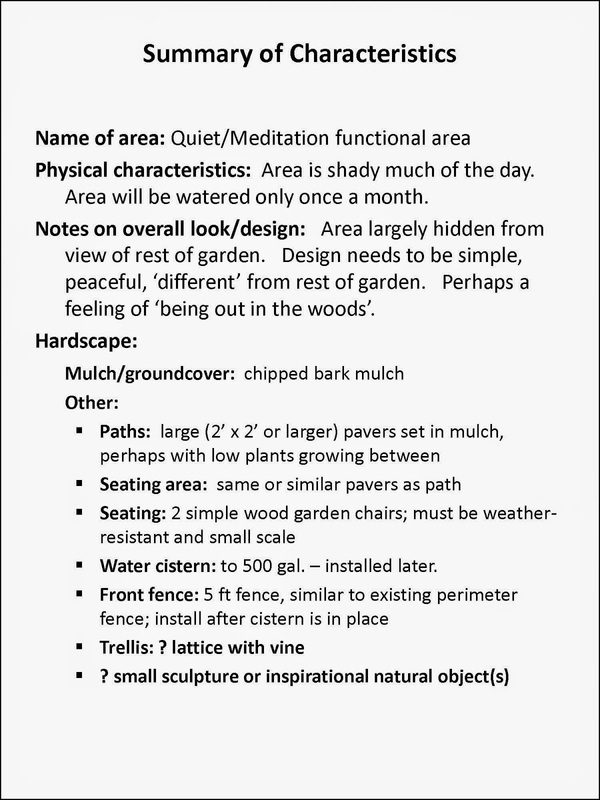 The gardeners find it extremely useful to sit in their future Quiet/Meditation Garden. They even sit and read their books, glancing up occasionally to take in imaginary views. Slowly a garden design begins to take shape. In reviewing their final design (below) the gardeners realize that they will either need to choose a very attractive water cistern, or plant a taller shrub in front of it to block the view from the seating area. An evergreen shrub, with a small statue, ornamental stump or other focal point might be just the ticket! Note that at this stage, the gardeners have blocked out major planting areas. They have also defined the basic characteristics of plants they want to include. It’s usually premature at this point to select individual plants (create a plant list) or create a planting plan (map with all the plants in their proper positions). You need to take time to think, imagine and reconsider. Sometimes a designer will have a particular plant they want to use. That’s fine. Some of the best gardens are designed around a single fabulous plant that the gardener adores. But don’t feel you need to choose your plants at this stage. What you’re creating now is a sketch of the final plan. We’ll take our design further next month, when it’s had a little ‘gestation time’. Nothing is more enchanting than the appearance of large butterflies in our gardens. 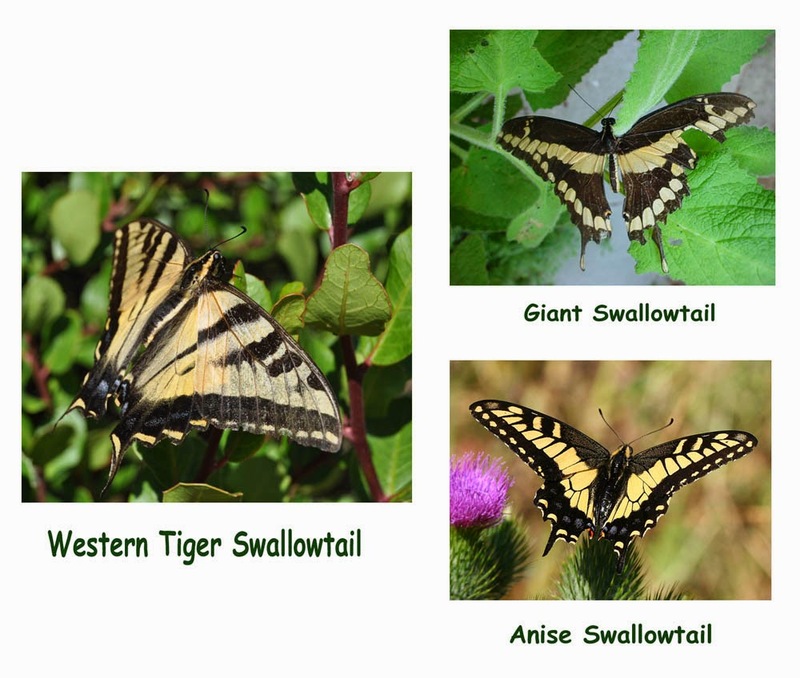 July is typically a busy butterfly month, but we’ve been watching the Western Tiger Swallowtails since spring. If you live in the western United States you may be enjoying them as well. To learn more about attracting butterflies to your garden see our June 2012 posting (http://mother-natures-backyard.blogspot.com/2012/06/butterfly-gardens.html ). The Western Tiger Swallowtail ranges through much of western North America from N. Dakota south to New Mexico; west from British Columbia, Canada to Baja California, Mexico. The species is similar to the Eastern Tiger Swallowtail (Papilio glaucus) of eastern N. America and is found mostly between sea level and 5000 ft. (1500 m.). The tiger swallowtails were formerly included in the genus Pterourus. Many westerners recognize this butterfly on sight - it’s large, distinctively colored and relative common. While actually at home in riparian woodlands and stream sides, it’s not unusual to see these butterflies in gardens and city parks. One thing is certain: you’re more likely to see them in places that have food for their larva (caterpillars): Willows, Cottonwoods, California Sycamore (Platanus racemosa) and ash (Fraxinus spp.). That’s why we have so many Tiger Swallowtails in Mother Nature’s Backyard. 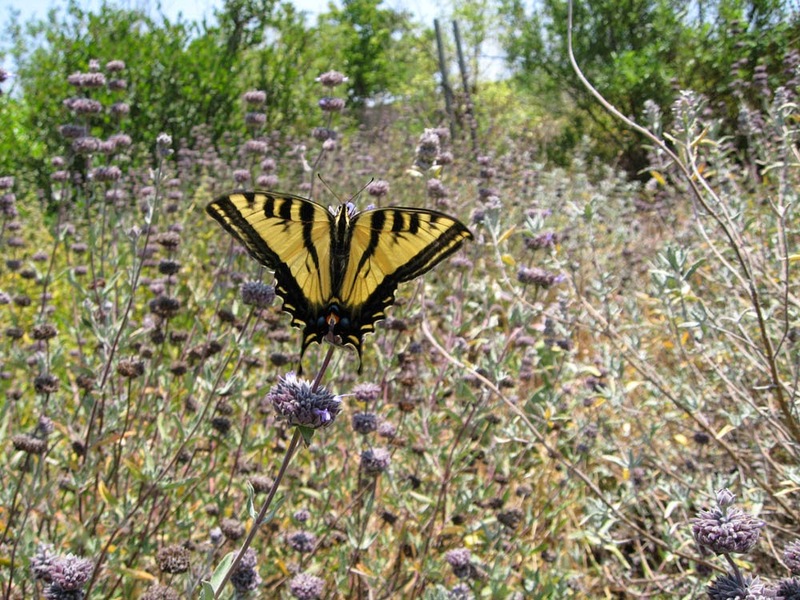 Two other swallowtail species visit western Los Angeles county gardens (see above). The Giant Swallowtail is a large black butterfly with a prominent yellow triangle on its open wings. The Anise Swallowtail, common in some neighborhoods, looks like a large yellow butterfly wearing a set of heavy black shoulder-pads with 3 short yellow stripes. The Pale Swallowtail, which has similar markings to the western tiger swallowtail, is black and white (rather than black and yellow) and is rare in gardens. 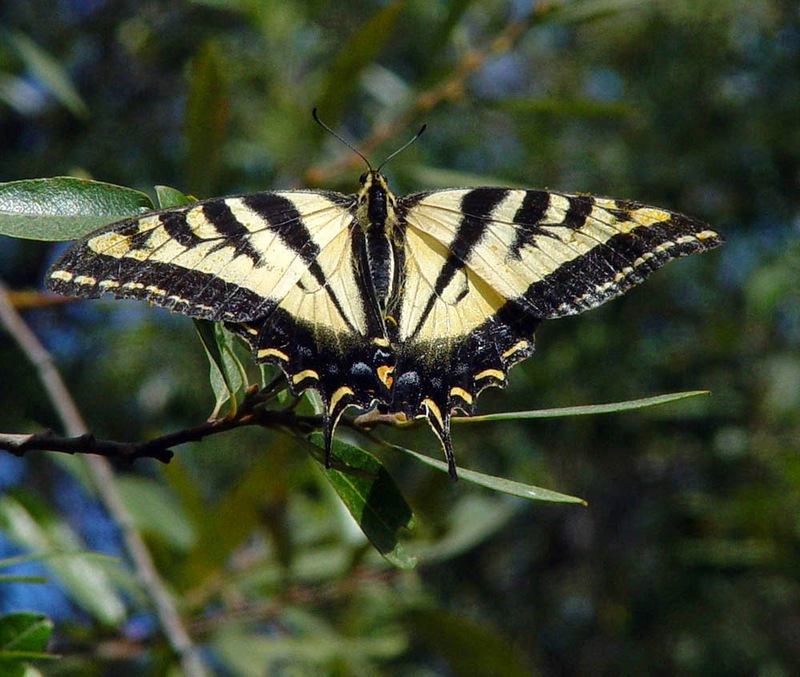 Western Tiger Swallowtails are large butterflies. Their wingspan can be as much as 2 ¾ to 4 inches (7 to 10 cm), making them one of the largest butterflies in many western gardens. Females are larger than males, but otherwise similar in appearance. They are brightly colored, predominantly yellow and black, with spots of blue and red/orange. The wings are striped like a tiger – four black stripes on yellow - on both the upper and under surface. The margins of both fore- and hind wings are edged in black with yellow dashes. The hind-wings have ‘tails’ reminiscent of the tail of a swallow – hence the common name ‘Swallowtail’. The lower inner margins of the hind-wings have a dot of blue and orange (some individuals may have additional blue spots, particularly on the underside of wings). The head and body (thorax and abdomen) are striped yellow and black. The antennae are knobbed (not hooked) at the tip. You can get a good look/photo of these butterflies as they sun or nectar, often with their wings spread. More excellent photos are available at: http://www.butterfliesandmoths.org/species/Papilio-rutulus and http://nathistoc.bio.uci.edu/lepidopt/papilio/tiger.htm . 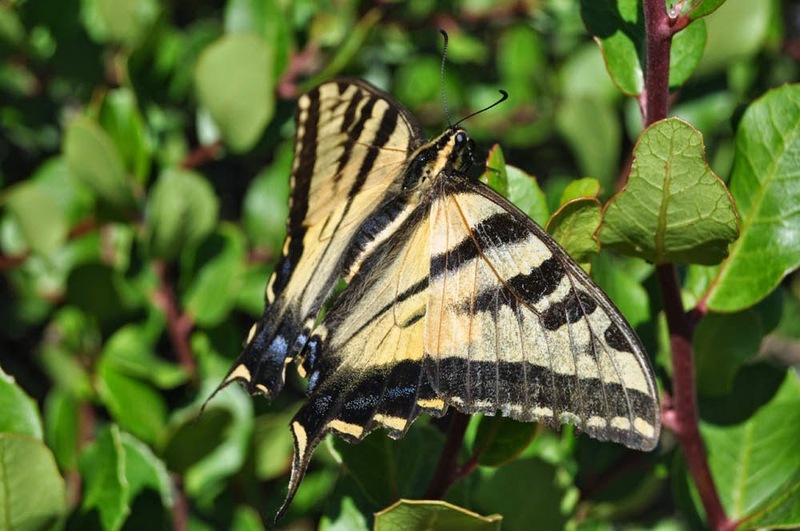 While limited to summer in colder climates, Tiger Swallowtails fly from January through September/October (even all year) in warm S. California sites. You may note that spring-flying individuals are slightly smaller and paler than their summer counterparts. But they still are distinctively Tiger Swallowtails. It’s not uncommon to see males patrolling back and forth through the garden, searching for receptive females. In the wild, males congregate at shallow pools or damp ground to drink and obtain dissolved minerals. This behavior (termed ‘puddling’) is not often observed in gardens, in large part due to a lack of suitable damp ground. Males also feed on carrion and dung. And both male and female adults visit a wide range of flowers to obtain nectar (food). Females lay eggs on the leaves of host plants (plants that provide larval food). The eggs, which are shiny, round and deep green, are laid singly on the undersides of leaves. A female produces approximately 100 eggs in her lifetime. If you are fortunate, you may witness a female laying eggs. She curves her abdomen down, releases a sticky egg and deposits it on the leaf. The tiny caterpillar (larva) emerges 4-5 days later. Ah, the miracle of life! Later stage instars are bright green with a pair of large eyespots, resembling eyes, at the tail end. This protective coloring also serves to camouflage and fool predators. The larvae also possess another potent weapon. They can raise a brightly colored (and foul smelling) forked organ called the osmeterium (‘stink horn’) from behind the head. The sight and smell of a raised osmeterium are enough to frighten off many potential predators. Tiger Swallowtail larvae eat leaves, grow and poop – that’s what caterpillars do! The larval food plants vary somewhat from place to place but always include willows (Salix species), Cottonwoods and Aspen (Populus species) and Ash (Fraxinus species). In California, additional native plant sources include the California Sycamore (Platanus racemosa), plants in the Cherry Family (Prunus species), Birches (Betula species) and Alders (Alnus species). The larvae usually live high in trees and shrubs and are seldom seen by humans. 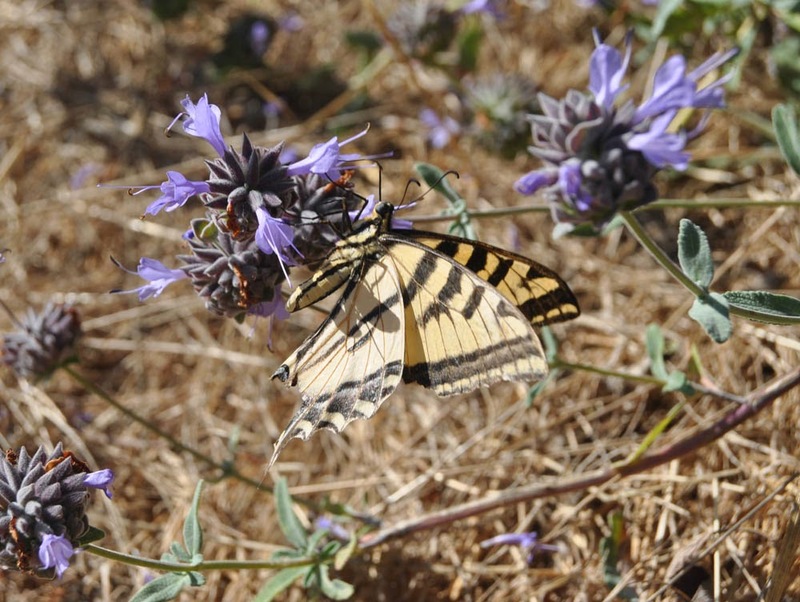 Western Tiger Swallowtails have 2-3 broods in warm coastal S. California (only one in colder areas). Summer larvae progress through their development rapidly – sometimes as quickly as 15-20 days from egg to butterfly. Summer broods tend to be the largest. Late (fall) broods over-winter in the chrysalis in many areas. As an aid to camouflage, the summer chrysalids are bright green while the fall/winter ones are brown to blend in with surrounding wood. Butterflies emerge from the winter chrysalids from January through spring, depending on the ambient temperature. Watching butterflies in the garden is a fascinating hobby. It’s inexpensive, you don’t have to travel and you can learn a great deal about the natural world. You may even discover something new about insect behavior! All you really need are patience and a comfortable place to sit; a camera and binoculars are also useful tools. 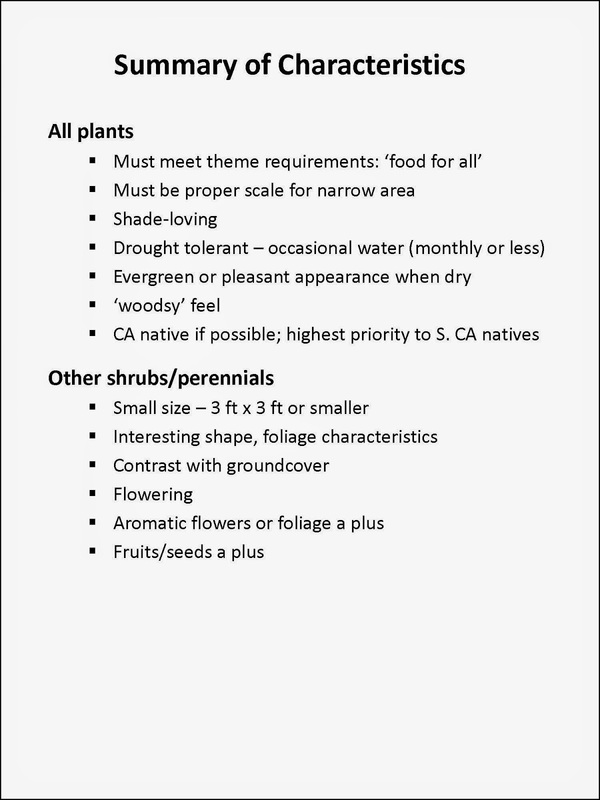 · California native plants: cottonwoods, poplars and willows are too big and invasive for most yards. Try instead native White alder (Alnus rhombifolia), native Prunus species like Hollyleaf & Catalina Island cherries (Prunus ilicifolia), Desert Peach (Prunus andersonii), Desert Almond (Prunus fasciculata), Desert Apricot (Prunus fremontii), native plums and Western chokecherry (Prunus virginiana var. demissa) and California ash (Fraxinus dipetala). Provide a source of water. This doesn’t need to be large or sophisticated. We use glazed clay saucers (like you put under pots) filled with garden soil, gravel and water. You’ll need to add water daily in warm weather. If you’re clever, you could probably adapt a hose-fed birdbath dripper to provide water during the day. Provide sunny, safe places for sunning. Butterflies need warm, safe places to perch and warm themselves. Tiger Swallowtails prefer to perch on leaves - most shrubs with medium to large leaves are fine. The area should be sunny and out of wind if possible. Encourage your neighbors to follow butterfly-friendly practices in their yards.